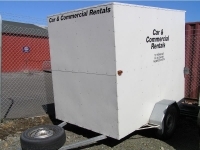 We have a variety of different sized rental trailers, from baggage trailers through to tandem axle furniture trailers. Travelling away over a holiday period and just need a little bit more room, consider taking a baggage trailer. Keeps all of your belongings safe and dry. Trailers are also great for storing sports equipment and extras for sports teams and school groups.